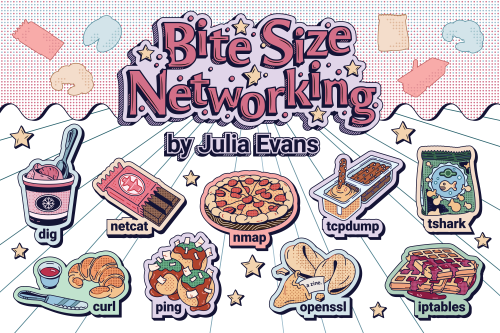 You can get it for $10 at https://wizardzines.com/zines/bite-size-networking/! (or $150/$250/$600 for the corporate rate). Here’s the cover and table of contents! A few people have asked for a 3-pack with all 3 “bite size” zines which is coming soon! and as often happens with computers none of them are really that hard!! But the man pages for the tols you need to do these things are Very Long and as usual don’t differentiate between “everybody always uses this option and you 10000% need to know it” and “you will never use this option it does not matter”. 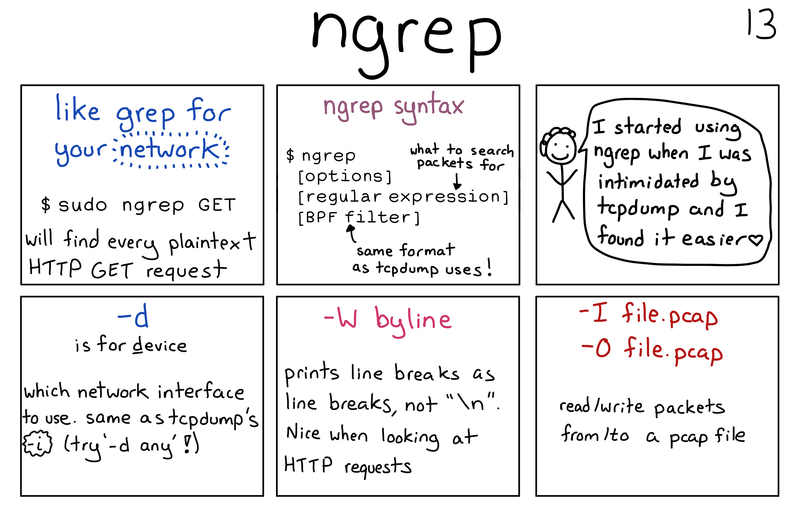 So I spent a long time staring sadly at the tcpdump man page. It’s Thursday afternoon and your users are reporting SSL errors in production and you don’t know why. Or a HTTP header isn’t being set correctly and it’s breaking the site. Or you just got a notification that your site’s SSL certificate is expiring in 2 days. Or you need to update DNS to point to a new server. Or a server suddenly isn’t able to connect to a service. 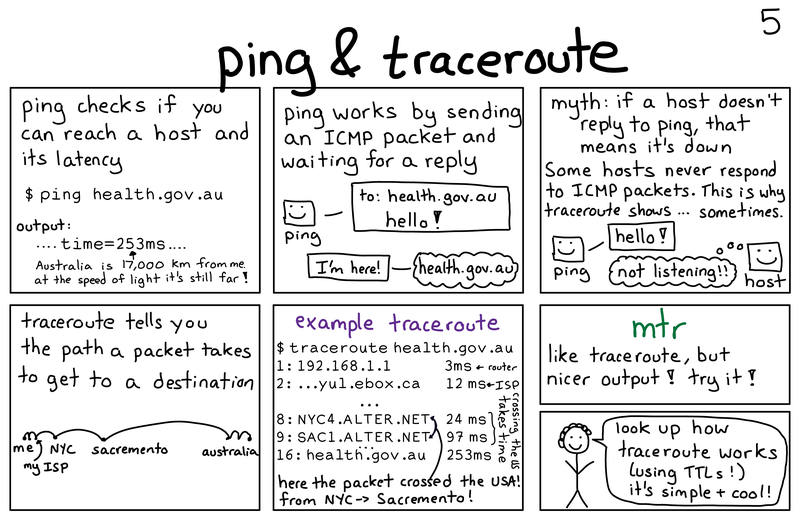 And networking maybe isn’t your full time job, but you still need to get the problem fixed. next thing to get better at: getting feedback! One thing I’ve realized that while I get a ton of help from people while writing these zines (I read probably a thousand tweets from people suggesting ideas for things to include in the zine), I don’t get as much feedback from people about the final product as I’d like! I often hear positive things (“I love them!”, “thank you so much!”, “this helped me in my job!”) but I’d really love to hear more about which bits specifically helped the most and what didn’t make as much sense or what you would have liked to see more of. So I’ll probably be asking a few questions about that to people who buy this zine! When I made the switch about a year ago from “every zine I release is free” to “the old zines are free but all the new ones are not free” it felt scary! It’s been startlingly totally fine and a very positive thing. Sales have been really good, people take the work more seriously, I can spend more time on them, and I think the quality has gone up. And I’ve been doing occasional giveaways for people who can’t afford a $10 zine, which feels like a nice way to handle “some people legitimately can’t afford $10 and I would like to get them information too”. Organizing this blog into categories Why are monoidal categories interesting?